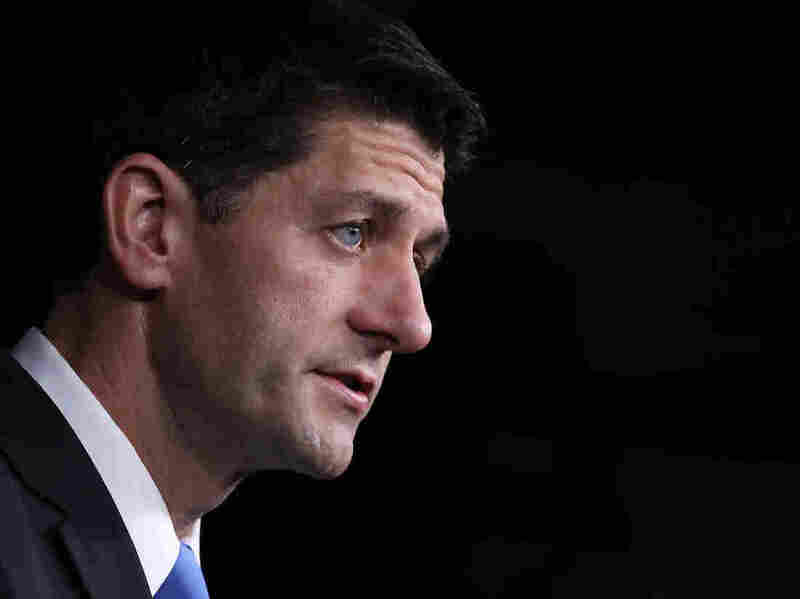 Paul Ryan's Health Care Plan Would Privatize Medicare : Shots - Health News An overhaul of Medicare must be part of efforts to repeal and replace the Affordable Care Act, according to House Speaker Paul Ryan. His plan would ask insurers to sell Medicare policies on exchanges. House Speaker Paul Ryan, R-Wis., speaks to the media during a briefing on Capitol Hill in September. President-elect Donald Trump and House Speaker Paul Ryan agree that repealing the Affordable Care Act and replacing it with some other health insurance system is a top priority. But they disagree on whether overhauling Medicare should be part of that plan. Medicare is the government-run health system for people age 65 and older and the disabled. Trump said little about Medicare during his campaign, other than to promise that he wouldn't cut it. Ryan, on the other hand, has Medicare in his sights. In fact, the opposite appears to be true — Obamacare may actually have extended the life of Medicare. This year's Medicare trustees report says the program would now be able to pay all its bills through 2028, a full 11 years longer than a 2009 forecast — an improvement Medicare's trustees attribute, in part, to changes in Medicare called for in the Affordable Care Act and other economic factors. And the irony of the Ryan Medicare plan, say some health policy analysts, is that it would turn the government program into something that looks very much like the structure created for insurance plans sold under the ACA. "The way it works is comparable to Obamacare," says physician and conservative policy analyst Avik Roy, founder of the Foundation for Research on Equal Opportunity. Ryan's plan would set up "Medicare exchanges" where private insurance companies would compete with traditional government-run Medicare for customers. Obamacare exchanges sell only private insurance plans. People would get "premium support" from the government to pay for their insurance under the Ryan Medicare plan. The subsidy would be tied to the price of a specific plan offered by an insurer on the exchange, much like the Affordable Care Act subsidy is tied to the second-cheapest "silver" plans. And the payment would be linked to a recipient's income, so lower-income people would get a bigger subsidy. The subsidy would rise as beneficiaries get sicker, to ensure access to insurance. As with Obamacare, people who choose plans that cost more than the government subsidy would have to pay the balance. Insurers would have to agree to issue policies to any Medicare beneficiary, to "avoid cherry-picking," and to ensure that "Medicare's sickest and highest-cost beneficiaries receive coverage." The changes would start in 2024, when people who are now about 57 become Medicare eligible. Roy agrees with Ryan that Medicare is going broke and that a program structured in this way would save money through "the magic of competition." "If you have 10 insurers competing for that business, you're going to negotiate a better deal," he said. Medicare is already a dual public-private program. Most seniors today are enrolled in what's known as traditional Medicare, where the government pays for medical appointments, tests and hospital stays on a fee-for-service basis. Alongside that program is Medicare Advantage, an insurance plan provided by a private insurer that may offer seniors additional services like dental care at the same price. The government pays a fixed monthly fee to the insurer for each Medicare Advantage patient, rather than paying for every service separately, as it does in traditional Medicare. About half of Medicare's new enrollees choose Medicare Advantage plans, says Henry Aaron, a health care economist at the Brookings Institution. Aaron says Ryan's proposal aims to move almost all seniors into Medicare Advantage-style insurance by making traditional Medicare too expensive for the consumer. But, he says, there are risks to that approach. "The real question here is whether the requisite safeguards are in place to ensure that the elderly and people with disabilities would be able to maneuver in such a system," he says. That's because the health care and health insurance systems are very complex. Doctors move in and out of networks, copayments can vary and plans can change. Millions of people on Medicare are also eligible for Medicaid, meaning they are poor and vulnerable, Aaron says. And at least 8 million Social Security beneficiaries have been declared financially incompetent and are assigned a representative to manage their money. "What you've got here is a group of people who are very sick, poor, and often cognitively impaired one way or the other," Aaron says. "Tossing people like that into a health care marketplace and saying, 'Here, go buy some insurance,' is a recipe for problems." Seniors may feel the same way. Researchers at Brown University last year found that as people get older and sicker, they tend to drop Medicare Advantage and opt for traditional Medicare. Ryan has been working on his plan to change Medicare for many years. A version of his "premium support" plan was included in several budget proposals he put forth when he was chairman of the House Budget Committee. The Congressional Budget Office says the proposals would reduce federal spending on Medicare. At this point it's unclear whether Trump shares Ryan's ambitions to upend the current Medicare system. Trump didn't include Medicare reform on his campaign website. But since his election, "modernize Medicare" has been included on the list of health care priorities on his transition site.